This week, many of us were reminded that water is one of those things that you only miss when it’s gone. Thousands of people learnt that the hard way as the fast thaw caused hundreds of pipe bursts across the UK. We’ve undertaken some social media analysis (something we’ll share later) and although there was a lot of negativity in the >5000 messages we’ve analysed, it was nice to see some people take the time to thank water company contractors who have been working all day and all night – often in sub-zero temperatures – to get things back on track. owner of a large rainwater harvesting tank, as some people are, thanks to visionary investment from the UK’s water companies. Those customers know they will have enough water to run their washing machine and flush their loos even when mains supplies are off. That still leaves drinking and cooking and showering, of course – and having to ration your water-use for those items must be frustrating to say the least, and much worse than that for vulnerable users. But all the people with a rainwater tank are, of course, using up to 50% less water – all year round. Roll that level of reduction out across a wider area, and that leaves a lot more water to go round at times of crisis. At one recent scheme, our client’s main motivation for installing our Rainwater Management System was to slow the flow, hold back water from a low-lying town centre, and reduce the operation of CSOs into the neighbouring estuary. But by sharing the tanks’ capacity with homeowners, the system can provide both flood alleviation and water conservation. Not to mention reduce pumping and treatment costs. And with reductions on water bills, take-up from customers is high. So perhaps next time there’s a big thaw we’ll begin to see the resilience benefits of rainwater management systems starting to take hold? PS It was too cold for concrete – so John spent the day giving lifts to people whose cars were stuck in south Devon. Fortunately everyone seems to agree that rainwater harvesting tanks close to community gardens in Southwark are a good idea. We had planned to decorate them with artwork by children from a local school we’ve been working with, but it felt like a sensible idea to go and have a chat with local residents first. The beautiful thing about engagement like this is the way it enriches your understanding of communities and projects. Members of the Alberta Tenants and Residents Association, who I met last Monday, were pleased with their new 800-litre rainwater tank. a blank wall and a landscaped garden area, they opted to leave the tank undecorated. Which, of course, is fine – community engagement for SuDS is all about being able to flex projects so that people feel listened to and involved. I also got insight into how people planned to use the tank, and we agreed to make adjustments to the tap fitting to accommodate that. Whatever the feedback you’re getting, it’s almost always worthwhile to go and meet stakeholders face-to-face. Concerns can be allayed, agreement can be reached, and plans can be made. Above all, relationships are formed, and that is how trust is built. I remember once seeing a sign on a door that read: “Assume nothing”. It’s wise advice. By engaging with communities, you don’t always get what you expect, but you can get something even better: a solution that everyone’s signed up to. Engaging experiments with the next generation of rainwater specialists! The beauty of working in rainwater harvesting is how quickly people pick up the concept and become enthusiastic about it. Water is such an essential part of life, people grasp how important it is to make better use of it. Of course, the reality of retrofitting smart rainwater management systems is that it is quite a complex business. But the concepts are beautifully simple, which lends itself really well to engaging with schools and school children. With this in mind, I had great fun designing my ‘experiment rig’ for my assembly at a primary school in Southwark as part of our OrganiCity EU experiment. I wanted something hands-on the children could get involved in, that wasn’t too complicated, and that would give us a very clear ‘result’. I settled on trying to demonstrate that rain falling on a hard surface runs off much faster than rain falling on a permeable surface. I had one problem: it all had to be light enough, and compact enough, to transport by train. So real grass turf and paving slabs were out. My polystyrene “pavement” and “grass” made out of sponges (topped with fake grass for effect) worked a treat. A couple of plastic tubs from the recycling were perfect, and everyone loves those Plui bath toys where you can make it rain at the lift of a finger. We timed how quickly 10 mL of water ran off the “pavement” and how quickly it ran off the “grass”. They learnt that not all the 10 mL came out of the “grass” – not only had it slowed the flow but it had absorbed some of the water too. Keep following us to hear about the art workshop I led with Y5 pupils, to brighten up the tanks in the school and the community. Last year, we received funding from Future Cities Catapult to demonstrate a “proof of concept” of our smart rainwater management system, something we’re building on and taking further in our OrganiCity project. In the summer, Digital Catapult and Future Cities hosted an Innovation Demo Day with “ten of the hottest start-ups ready to shape the future of IoT”. Caroline Gorski, Head of IoT at Digital Catapult, said the evening was about “celebrating the new technologies that we’ve supported through the Things Connected programme”. She added it was “exciting” to see how these “innovators” had progressed, built on the ideas they had, and started to move closer to the marketplace. Of the 120 SMEs that applied for the ‘Things Connected’ programme, OTA Analytics were one of only 25 that were selected. Around 60% of these SMEs (including OTA) had ‘graduated’ by the demo day event in July, meaning they had built and tested solutions, met customers and created a prototype to take forward. The event brought together a variety of different applications of IoT and allowed innovators to share their experiences with an audience of like-minded trailblazers. Dr Mike Short, Vice President of Telefonica, said some of the SMEs he’d met that evening were “very creative” and that he could see how collaboration could take them to “another level”. He added that IoT will connect more people and things “beyond our possible imagination”… and that the “opportunities are huge”. Mark Harrup, Strategy and Business Development Director at BT said he’d seen “well-rounded ideas and slick presentations” but the thing they like the most is “the transformation of opportunities that IoT brings”. This week, OTA began the installation of our smart rainwater tanks in Southwark. John and Jimmy set off to London on Monday evening, and have been laying the foundations for the four community tanks to be plumbed in. Hossein will join them later in the week to attach the smart technology and sensors that will allow us to collect data and monitor the tanks’ performance for our OrganiCity project. After a quick tour of the residential sites, Lorna and I visited a local primary school to discuss educational workshops we hope to deliver to encourage community participation and engagement with the technology. Just before the festive break, Team OTA gathered at their HQ to assemble the smart rainwater management systems (RMS) that will be installed in London next week. After their hard work bringing everything together, they celebrated 2017 with a Christmas meal in Exeter! The tanks, built in the penultimate week of December, will be used to: manage the local water resources, and help to mitigate sewer flooding; provide water for community gardening projects; and educate school children, through a series of creative and technical workshops linked to RMS. Hossein, Peter, Dan, and John set to work assembling the fittings and loggers for the tanks which will be used in our OrganiCity project, “RainSense“. They assembled four tanks, which will be installed at four London locations in collaboration with Southwark Borough Council, and an extra one which will be kept at OTA HQ for benchmarking. OTA’s smart “Internet of Things” technology will be powered entirely off-grid, using solar panels. 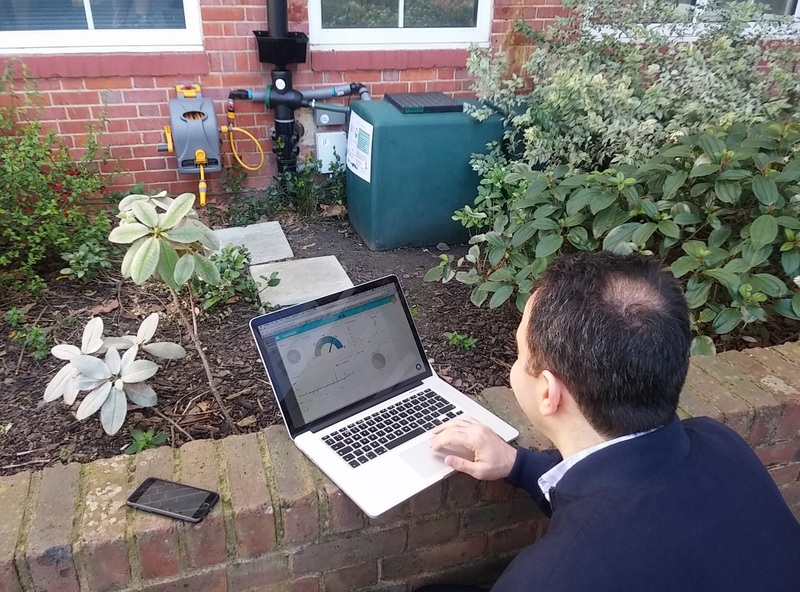 The data will be used to validate whether smart RMS can be cost-effectively deployed throughout UK cities as autonomous stormwater flood prevention and drought mitigation assets. The Safe and SuRe team, led by Professor David Butler, aim to deliver resilient urban water systems to cope with today’s global challenges… much like OTA Analytics! Photos from the event are available here. Here’s a sneak peak of Pete in action, showing attendees some of the pilot installations we have already completed in London. Photo Credit: University of Exeter, Flickr. We were recently awarded OrganiCity EU-funding for 2017-18 (@organicity_eu). Our Community Engagement Manager, Lorna Devenish, explains why our project, “Magic Water Management” is important. C) it’s always in the wrong the place. Since the Victorians’ culverts, we’ve taken some pretty heavy-duty engineering steps to hide it out of sight andmake it less of a problem. Some of those culverts are as big as a church. Some of the more modern open ones are like a two-lane highway. That’s a lot of bricks and concrete to tame a stream. C) by doing both at the same time, help our cities to adapt to what the future throws at them! Gardeners at Southwark Council are struggling to access enough water for their water planters and green spaces. They’ve turned to us, as rainwater harvesting experts, for a solution. We’re putting in a series of 800 L tanks fed from roof downpipes to capture rainwater for use in community gardening projects. The success of this project could see more deployed across London’s green spaces. I’ll be working with those communities to explain what we’re doing, and, I hope, help to ensure the long-term viability of community projects. Photo courtesy of May Project Gardens. I’ve spoken to a lot of customers in RainWise Projects at OTA Analytics, and people love the concept of rainwater harvesting. They totally get it.Their passion for it makes me think back to a conversation I had when I first started in the water industry. I was working in an area of the country where water bills were pretty expensive, and this was causing a lot of pain to customers. Part of my job was to justify the cost. A wise old head, the then Environment Manager, explained to me the visceral nature of people’s relationship with water. In olden times, the feudal landlord controlled the well and whoever controlled the water had the power. Putting water back in the hands of people gives them the power to grow food for themselves. It’s easy to take for granted a temperate climate, where the rain* brings all the watering you need for a pretty lush front lawn. Most things grow, with a bit of a helping hand, often too much. I recently visited America, to stay with my sister and brother-in-law. I was astounded that everywhere I looked there was a perfect, uniform, bright green lawn, which had been watered, fertilised and laced with herbicide. Weather varies widely across the continental USA: the Southwest is arid, the Northwest is cooler and wetter, and the Midwest and Northeast have four distinct seasons. Generally speaking, summer in America is hotter and drier than we’re used to in the UK. So the desire to grow (and water) lawns left me somewhat confused. She informed me that it was a status symbol, and sort of expected within a neighbourhood. I was itching to suggest ways to harvest rainwater, to reduce the amount of highly treated potable water sprinkled on the grass. She was sort of sympathetic and my American brother-in-law quite liked the idea of converting the grass to wildflowers, but they were not fully convinced. As the heat of the day came in, we stepped inside for a glass of water. Herein came the second problem. Whilst taste is a personal preference, the water I drank did not taste good, and I was left wondering whether the high volumes of water being used (water use per capita is twice as high in the USA than the UK), were taking their toll on the pipes in the network. With a growing population and less predictable rainfall patterns, we (i.e. inhabitants of the spaceship we call Earth) need to use what we have more wisely. Promoting water conservation is a necessity. Water should be viewed as a precious, scarce and lovingly treated resource. Rainwater should be seen as an opportunity, not a threat. I wonder if a step change can be made culturally, in the deep-seated need to preserve a non-native, water-guzzling, green desert outside of our homes. Doing so, could create space for smart, sustainable, and (with careful design) aesthetically pleasing raingardens and planting. Living the American Dream is one thing, but I can’t wait to get back to working towards a Sustainable Dream. Making small changes in planting, rainwater capture and day to day behaviors can help the UK become an exemplar to others on how to manage our precious water more sustainably. Lorna Devenish is our Community Engagement Specialist, with 20 years+ experience in water sector communications. She has led co-design workshops for green space and urban realm projects.